comply with the IT laws, rules, codes and standards that apply to your organisation. We can help you to do it practically and effectively. What IT Laws must an organisation comply with? What should you consider? What IT legal risks you should address? What laws relate to information, communication and technology (ICT)? What could happen to you if you don’t comply? We offer a presentation, workshop, or executive briefing on this topic by an expert with practical experience. 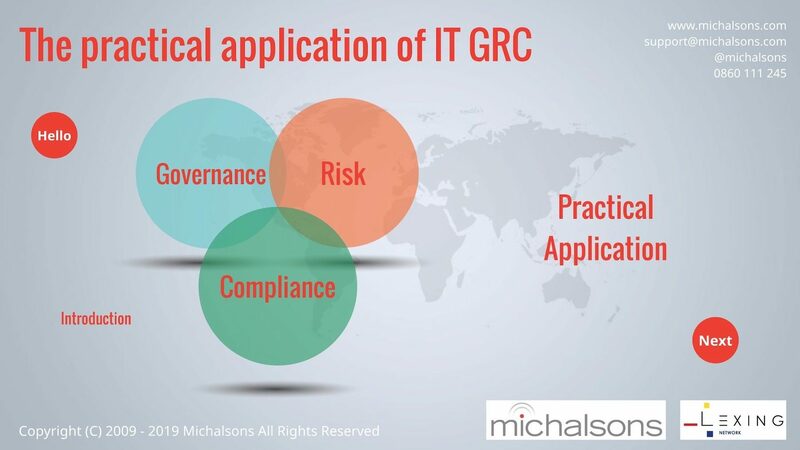 Raise your awareness of IT GRC by getting an overview of the topic. Get a roadmap for the next few years by getting a working understanding of the regulatory road ahead and the impact on your organisation and its business. Transition from King III to King IV simply and effectively by knowing how and getting tools. Apply the King Report and King Code from an IT perspective by knowing the difference between King III and King IV, and knowing what action to take. Know what IT laws exist and which ones are most applicable to your organisation by getting an overview. Apply the principles of GRC to real issues or topics in a practical way by workshopping real issues. Be up-to-date with the latest law and find quick answers to your questions. Identify some practical action items to focus on. Know how you can monitor, evaluate, and assess compliance with external legal and regulatory requirements related to IT. Our IT GRC workshops have been well received and attended by hundreds of people over many years. We have not yet set dates for our next full day public workshops. If you’d like to attend a public workshop on this topic but we have not yet set dates (or the location or dates don’t suit you), send us an email asking us to set a date in your city. One delegate costs R4,750 ex VAT. Two or more delegates qualify for a 10% discount. We will serve lunch and refreshments. We limit delegate numbers, so bookings are done on a first come, first served basis. We aim to give practical insights that you can use to be effective. We do not give law lectures! We will refund you if you do not think you received value. We also offer tailored private events that can be held at your premises on a day that suits you. Why IT GRC is important. What is IT or ICT anyway? The relationship between the three sisters – governance, risk and compliance. The Regulatory Road Ahead – a road map of the next few years, including the King IV effective date. Governance with a focus on IT governance. An update and overview of the King Report. The differences between and transitioning from King III to King IV. An overview of the IT Governance Practices in King IV and how it differs from King III. Guidance on the disclosures you will have to make for King IV. Transitioning from King III to King IV. An overview of IT risk, including IT legal risks like the risk of non-compliance. Compliance with a focus on IT compliance. What must your organisation comply with? The governing bodies responsibility regards legal compliance as set out in King IV and how it differs from King III. An overview of IT laws, rules, codes and standards (both global and South African) – an analogy with a plumbing system, a matrix and dealing with overlaps. The practical application of IT GRC to real issues (like data protection, cybercrime law, access to information, cloud computing, robots, IT contracts, electronic signatures, email, and social media). We cover these topics at a high-level and the audience votes on which ones they wish to tackle in the time available. Who is responsible – getting governance structures right. An assessment of your organisation. The latest developments, including recent South African case law and King IV Code. Tips for successful projects. Some quick wins and factors for success. Using frameworks – like an IT Legal Framework. Please email us and ask for the programme if you would like details. This is not an academic workshop for students. It is for people dealing with these issues in their organisations. Does it make sense for me to attend the IT GRC workshop? If your focus is just on finding a methodology to help you transition from King III to King IV, you’ll want to attend our King IV Workshop rather than this one. If you want to find out more about a particular topic like data protection, cybercrime or access to information, IT contracts or electronic signatures, we recommend you attend the specific workshop. Our comprehensive presentation covering IT GRC. A King III to King IV Comparison Table for IT governance setting out the difference between King III and King IV, and what actions need to be taken. A King Planning Tool to help you to outline the areas of governance that you have focused on in the previous financial year (or reporting period), and what you plan to focus on in the next one. A King Disclosure Tool for IT Governance. A Compliance Action Plan template. A hardcopy of the List of IT Laws. The IT Legal Framework Top 10 Issues and a 10% discount off the full IT Legal Framework. We have significant practical experience dealing with these specific areas. Our sessions are interactive – you are able to ask questions, have your specific issues dealt with, and influence the discussion-points. Our sessions are tailored to the attendees – we ask you questions in advance so that we know what your issues are and your existing level of knowledge. We do not give sales pitches, which is unfortunately so often what speakers do at conferences. We provide insight and simplify the issues, which can only be done after practically applying laws to real business issues. We empower you and do not try to entrench ourselves in your organisation. We cover the same ground in one day, rather than two. This saves you time and money. We tell you what you need to know, not everything. A practical attorney from Michalsons. We will ensure the attorney is the best person to present the course depending on the type of course, the date, the specific issues and the attendees. For example, John Giles often presents on this topic. John is a trusted independent legal adviser, who is a practising attorney. He helps many organisations govern IT, address IT legal risks, and comply with IT laws, rules, codes and standards. He has presented on the topic many times. 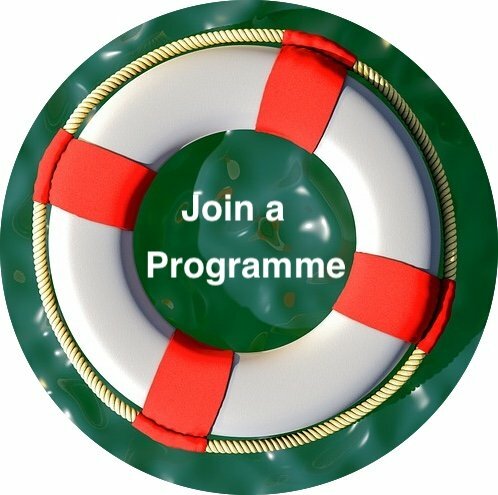 He has over 20 years of practical experience applying his knowledge to organisations to help them grow and avoid legal problems, difficulties, and disputes. He was one of the people who drafted the IT Governance chapter of King III™. We provide this IT GRC course in different formats. Public and private sessions can last for anything from 45 minutes, half a day or a full day. We welcome enquiries for more information and details. Our public events are at various venues around the world. We choose venues that are central and easy to get to, that have adequate parking, good food, and that ensure you are comfortable. We are also happy to give the data protection workshop or executive briefing at your venue.